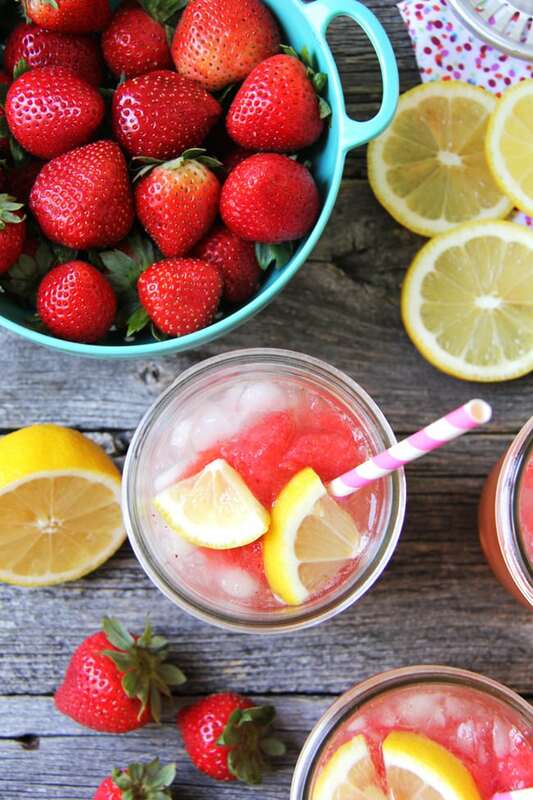 This Simple Strawberry Granita Lemonade recipe is a summer must have! It’s sweet, fresh and SO delicious! Happy summer friends! It is HOT here and I’m loving every second of it. Our winters are verrrrrry long so you won’t catch me complaining for one second about hot weather. 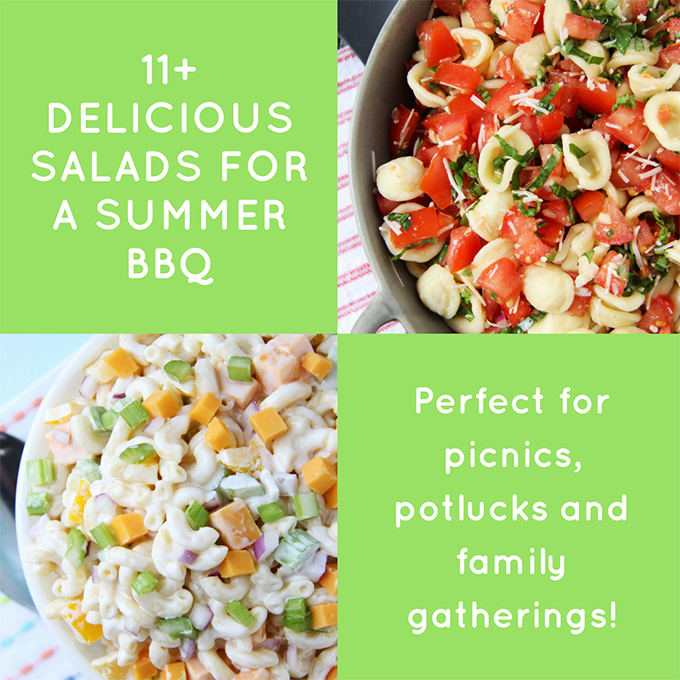 In fact I soak it up and we hit the beach, go for walks, have BBQ’s with friends and enjoy plenty of summer treats like popsicles, ice cream and refreshing summer drinks. Earlier this summer on one of these very hot days, I discovered a strawberry granita limeade type drink at Starbucks that I fell in love with right away. It was fresh, tangy and really really delicious. Not only that, it was very simple and I knew I could make it at home…because $6 a drink is expensive y’all and I knew I would be wanting a few of these over the course of the summer. The drink I made is a Simple Strawberry Granita Lemonade, which is comprised of 3 components: crushed ice, granita and lemonade. The granita portion of this recipe is kind of a cheater recipe in the sense that it’s not a traditional granita. Well, maybe it’s not really cheating, let’s just call it a short cut, because the flavour is all there, it just takes less time to make than a traditional granita, and less time is a winner in my books! Anyway, in case you didn’t know, granitas are semi-frozen Italian desserts made from sugar, water and different flavours, and they’re usually enjoyed as a stand alone dessert…basically flavoured crushed iced that you eat with a spoon. 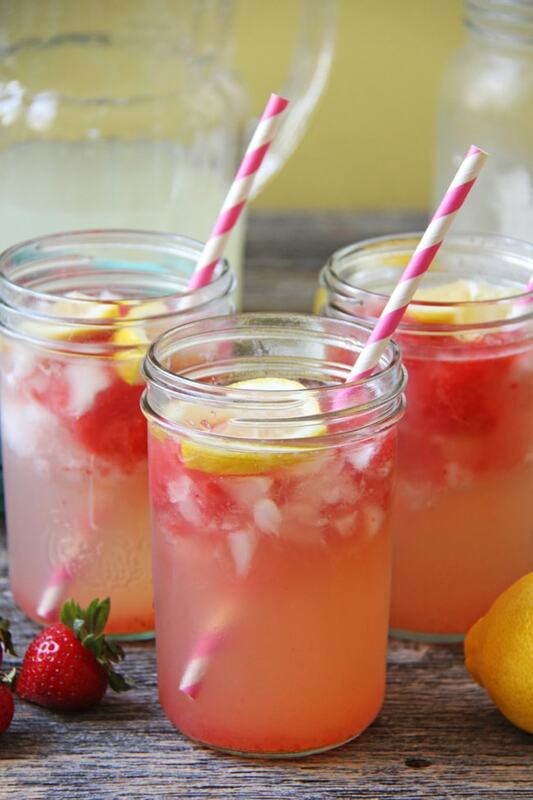 Also I thought the ice cubes might be a good idea to have around in case we wanted to make individual drinks when ever we felt like it…hot day, reach in the freezer for a couple of strawberry cubes, crush them up, then pour on some lemonade. Yes. 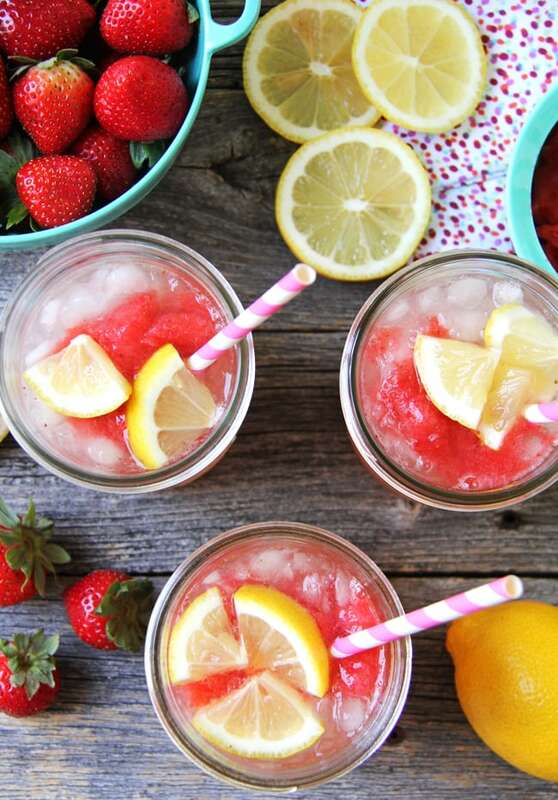 These are really simple…crushed ice, strawberry granita and lemonade poured on top. Add a straw. Sip. 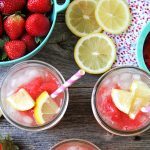 This would be a great drink recipe to serve at your next BBQ or gathering with friends. Create a drink station with some fun cups, fancy straws and drink dispensers like any of these from Wayfair, and give your guests a delicious time! 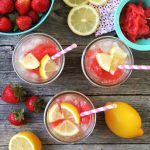 This Strawberry Granita Lemonade recipe is a summer must have! It’s sweet, fresh and SO delicious! 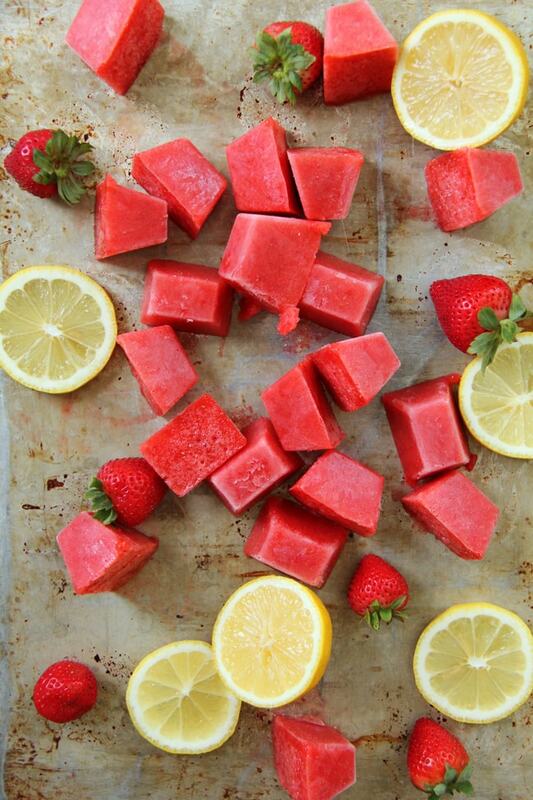 Add the strawberries to a blender and puree. Add in the 1/2 cup of cooled simple syrup and blend. Pour the mixture into an ice cube tray and let freeze completely. Add the sugar to the lemon juice and stir until the sugar is dissolved. Once the sugar is dissolved, add the water and stir. Add 2 or 3 frozen strawberry granita cubes to a blender and give the blender a quick pulse to break up the cubes into a coarse frozen mixture. Once that is done you are ready to make your drink! 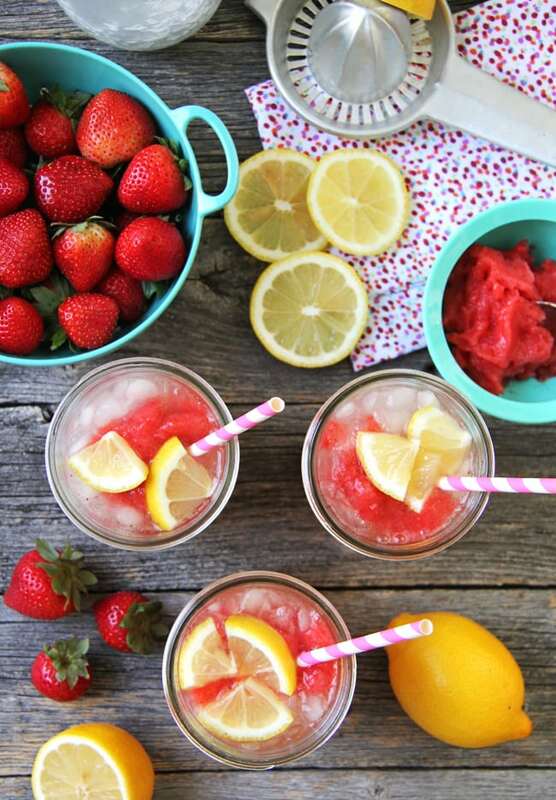 To a serving glass add a layer of crushed ice, then the frozen granita mixture then pour on the lemonade. Enjoy right away! 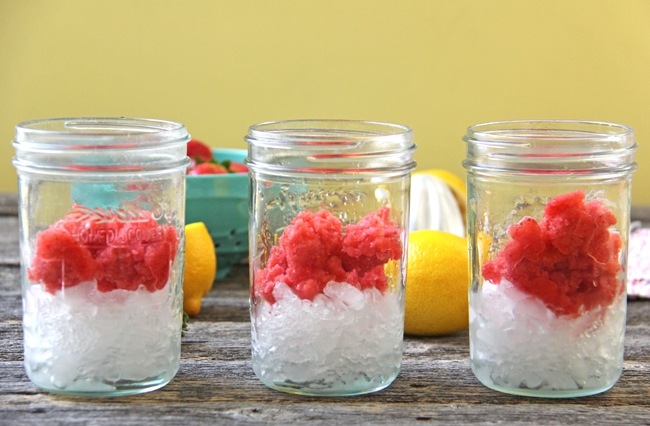 Just blend all of the strawberry granita cubes, then evenly distribute the ice mixture between 6 glasses the same way as above: a layer of crushed ice, a layer of the granita, then pour on the lemonade and enjoy right away! To make the simple syrup, just take equal parts of sugar and water (I used 1/2 cup water and 1/2 cup sugar). In a saucepan boil the sugar and water over medium to high heat, until sugar has dissolved. Then remove it from the heat and let cool completely. I just put mine in the fridge until I was ready to use it. 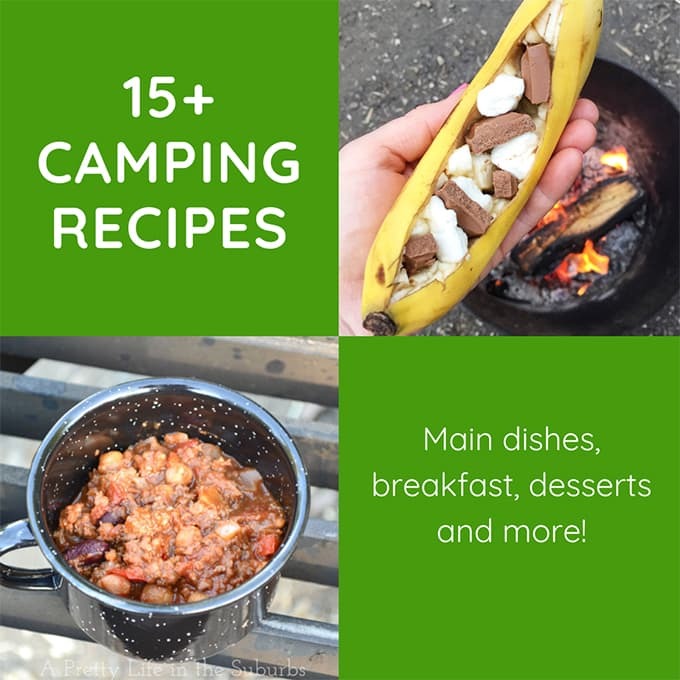 I hope you try this recipe and enjoy it as much as we did! 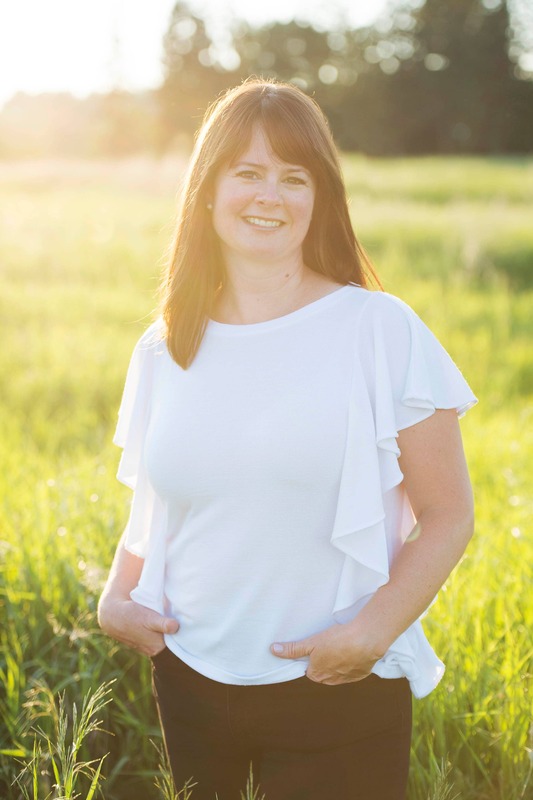 This post has been sponsored by Wayfair Canada! 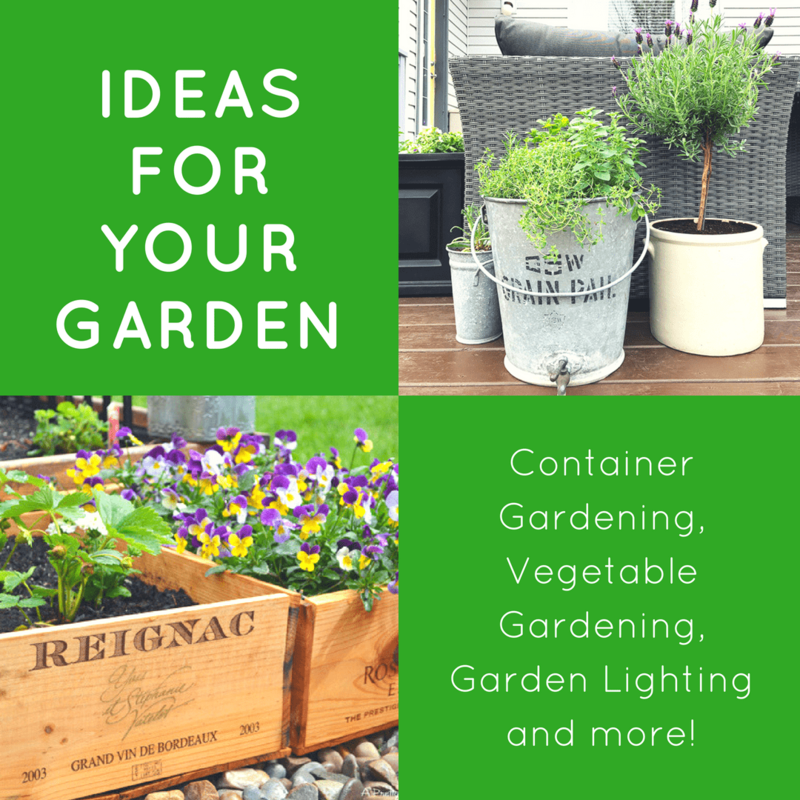 But as always, all thoughts, ideas, opinions, recipes and such are my own. 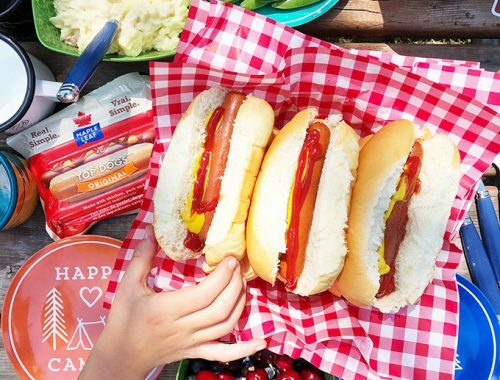 Maple Leaf Foods New Food Manifesto for Real Food is Good News for Us! Omg. I keep meaning to make simple syrup, so good with gin too. Oh mah goodness….that is making my heart flutter. Ok. I must make these pronto. 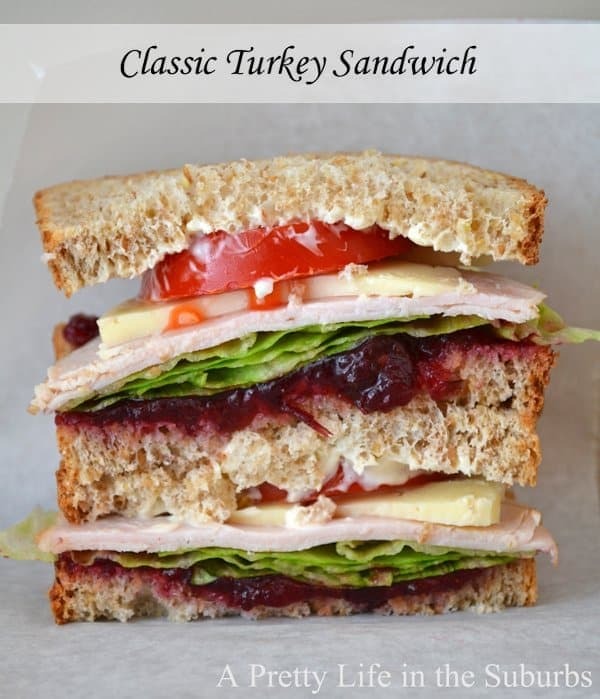 So good and so easy to make without hitting the ‘bucks. These look absolutely amazing! YUM! Thank you Heather! They’re SO good!